Trenbolone Acetate is used to promote weight gain following extensive surgery, chronic infection, or severe trauma, and in also other cases that result in inadequate weight gain or maintenance. It is also used to decrease muscle loss caused by treatment with corticosteroids and to reduce bone pain associated with osteoporosis. Trenbolone belongs to the class of anabolic steroids. It has the benefit of possessing no unfavorable metabolisms. It is not affected by aromatase or 5alpha-reductase, and is a Class I steroid, which binds very effectively with the androgen receptor. This steroid has a short half-life. This drug is a long-acting steroid, which is available as an injection. It has a significant effect on your protein metabolism. 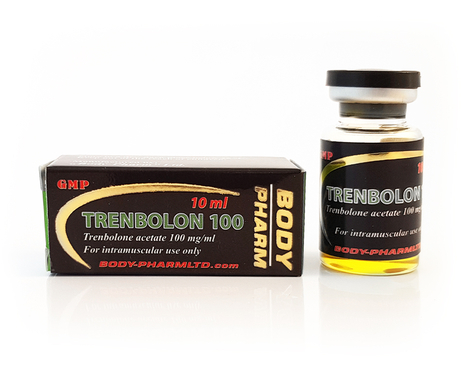 There is no doubt that Trenbolone is one of the most effective and reliable anabolic compounds. This is because it helps in promoting protein synthesis, and also produces a constructive nitrogen balance in your body. It improves your appetite and makes the conversion of proteins better. The hormone has never been approved for human use. Remember, Parabolan (Trenbolone Hexahydrobenzylcarbonate) is the only Tren compound ever approved for human use. For physique related purposes, most men will find a dose of 50-100mg every other day to be a fantastic range. 50mg every other day is a fantastic place to start with 100mg every other day often being all the Trenbolone Acetate many men will ever need. Very few men will need more than 100mg every other day during the off-season. If higher doses are to be used, this will most commonly be during the cutting phase. Some men will be able to tolerate 100mg every day or 200mg every other day, but this does increase the risk of side effects greatly, especially response related. 50mg every other day is often deemed a very low dose, but remember this is an extremely powerful anabolic steroid. This is a very controllable dose for most men, should be very comfortable, and should provide fantastic results. If not, something is wrong with your product. On the injection schedule, every other day will be the most efficient. Every day can be fine but won’t really provide much of a benefit over every other day. However, it is possible to only inject the hormone on a standard three day a week schedule, such as every Monday, Wednesday and Friday. This will cause a slight dip in blood levels with the two days in a row of no administration, but, outside of competition circles, it really shouldn’t be a big deal or even noticeable. Contact your local poison control center, or emergency room immediately. Symptoms may include confusion; one-sided weakness; vision problems.